This is an additional Beta application from Windows phone development, who will soon support other phone lumia. If you look at the picture below, there are not many settings that need to be modified. But, just to understand the function of each of the tools that give check. "Silent income call when i place the phone face down surface"
This means, your mobile phone will be the Silent mode if the phone lay with the position under the LCD screen. ther tools, you can try and then prove it with realistic. Does it work or not? Incidentally, for smart phone applications already supporting 625H Lumia Gestures because already we prove it realistically. You are on the website page WINDOWS MOBILE PHONE - setting and Upgrade. Windows phone gestures BETA With the link URL http://hand-uk.blogspot.com/2015/04/windows-phone-gestures-beta.html for this articles, you can bookmark or share to any. Our expectation that Windows smart phone users, can understand and know about OS Windows phone. 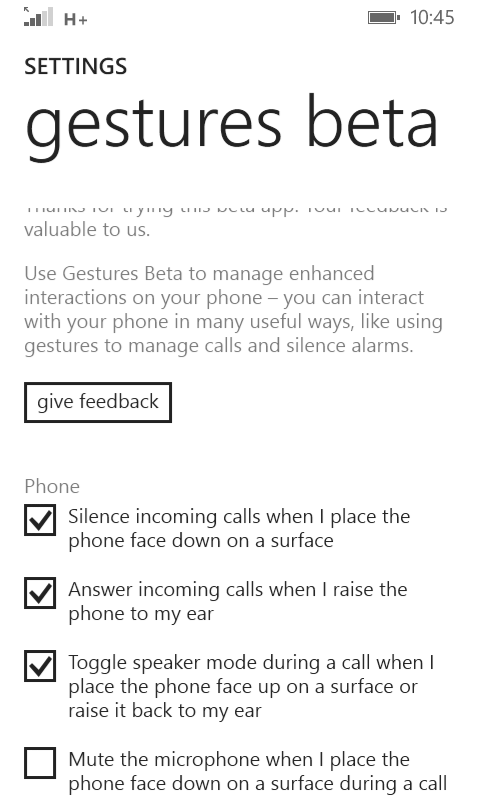 Windows phone gestures BETA Is a link for you, How to use the pure smart phone.